This view puts many contemporary park controversies in proper perspective. 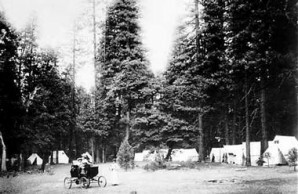 It is clear that Olmsted would have found a golf course in Yosemite Park an anomaly, not because people do not enjoy golfing in the midst of magnificent scenery or because golf is a less desirable activity than hiking, but because the center of attention would be diverted from the experience of nature to the achievements of man. By the same reasoning, Olmsted had no objection, as such, to building roads and to the use of vehicles in a park. To Olmsted, an issue like roads was not an either/or question but a question of speed and congestion. To build highways so that masses of people could be moved through the parks, catching a glimpse of the scenery as they passed, or to stop here and there to add to their list of “things done” the observation of a famous sight was to misconceive the purpose for which the parks were created. The rhythm of the rocks beats very slowly, that is all. The minute hand of its clock moves by the millions of years. . . . And if you listen carefully—when you have immersed yourself long enough, physically and mentally, in enough space and enough silence and enough solitude—you begin to detect, even though you are not looking for it, something faintly familiar about the rhythm. You remember hearing that beat before, point and counterpoint, pulsing through the inevitably forward movement of river and journey. . . . And you grasp at last, in a fuller and more certain way than you ever have before, that all these worlds move forward, each at its own tempo, in harmony with some unique basic rhythm of the universe. . . . We all of us experience this oceanic feeling, I think, at some time or other. . . . I felt, now, a sense of common origin and direction. . . . And while it lasted nothing else mattered, nothing else existed. Fletcher’s description, extravagant as it is, nonetheless encompasses the totality of experience that has underlain the impetus for a system of parks—from the limited setting of New York’s Central Park to the vast reaches of the great western national parks—the desire to create a setting in which there can be an immersion in the natural scene. From this perspective, it is plain why there has been vigorous objection to the use of the national parks for conventions, whether or not they take place in the “off-season,” and despite the fact that nothing in the nature of a business convention could be said to “impair the scenery.” A convention tourist cannot, by the very nature of his or her visit, submit fully to the rhythm of the place. The same reasoning explains why there has been opposition to downhill skiing developments, but no objection to cross-country skiing in the parks. The distinction has seemed too subtle to persuade some, but it is fully in accord with the Olmsted philosophy. Although one of the most delightful leisure activities, downhill skiing exists today as a magnet sport—drawing large numbers of people together in a small place, making them dependent upon rather substantial mechanisms for transportation to the top of the run, drawing a cadre of professional teachers, spawning classes with elaborate hierarchies of achievers, and turning a great deal of attention to a vast panoply of equipment and clothing. The end product, more often than not, is everything that characterizes an urban assemblage of people—crowds, striving, economic distinctions, feelings of dependence, time pressures, and the like. This is the antithesis of everything that the parks were designed to promote. A failure to appreciate that the parks are more than simply undestroyed scenery has led to another controversy—the proposed development of only a tiny fraction, perhaps 1 or 2 percent, of the total park acreage. The difficulty with this argument is that most developments are proposed for the most attractive and most accessible parts of the park. There may be a great deal of unspoiled Yosemite Park outside the valley, but it is to the valley that most visitors come, especially those least familiar with the park.